The exciting first book of the Darkness Falls series! The second installment of Darkness Falls. The conclusion of Katriona and Arland's story. Three huge mounds of vanilla ice cream sat in my bowl, covered with thick, zig-zagging lines of chocolate syrup, waiting for me to devour them. I plopped onto the couch and stared at the wonderful goodness waiting to greet my stomach. “Bet ya five bucks you can’t eat all that,” my big brother Kenny said, cheshire grin stretching up his face. Kenny laughed and chatted quietly with my parents while I dug into my evening treat, full of excitement. Bite after yummy bite slid down my throat, filling my seven-year-old stomach with more calories and sugar than any human should dare consume. Ignoring the growing ache, I continued eating. I was not one to back away from a challenge, not one to give up on five dollars. That was a lot of money. “You doin’ okay over there?” Kenny asked, rubbing his chin. Was he nervous? Giving up on that money was not in the cards for me; I hoped he knew it. “I’m okay,” I said, holding up a dripping spoonful and eyeing it with disdain. I took the bite, then another, and another, until all that was left was one last liquidy spoonful. My stomach gurgled, ice cream swimming all through it. “I can’t believe she’s going to do it,” Mom whispered, leaning close to Dad. He reached into his pocket, took a crisp five-dollar bill from his wallet and passed it to me. “I didn’t think you’d finish that. I’m impressed.” Kenny laughed. “Thank you,” I said in a singsong voice, then rushed to my room. Curling up in a ball on my bed, I cradled my churning tummy and closed my eyes. For the rest of the night I imagined what I’d do with that money, what I’d buy the next time my family made a shopping trip. I jittered as the sugar worked its way through my system, fidgeted with the hem of my lavender bedspread, tossed the blankets and sheets from me when I started to sweat, but it was all worth it because I won. I proved to my brother I wouldn’t give up. I’m not sure what I did with that money, but I learned something about myself that day: I’m a fighter, always have been, always will be. All the stress that goes into Christmas (shopping, wrapping, packing and shipping, shopping, shopping, and more shopping) sometime seem like a waste of time, but somewhere between when the family arrives, the exchanging of hugs, eating the food, and opening the presents, a weight lifts from my shoulders. I look around and see all the smiles. Laughter echoes off the walls, drowning out my exhausted thoughts with happiness. I don't mind that my feet and back ache from cooking and cleaning. I don't care about the pile of trash sitting in the garage because Waste Management decided not to pick up our garbage on Friday. In this moment of realization I’m not sure anything bad bothers me. This is what Christmas is about: time spent together as a family. My children will remember these holidays for the rest of their lives. They will tell their children stories of riding Kid #3’s Step 2 Coaster through my living room until they wore wheel prints in the carpet. Kid #2 will remember stealing so many cookies from the table before dinner that we didn’t even try to force her to eat her meal. Kid #1 will probably be working on his Lego Mindstorm robot for the rest of his life, so this Christmas will be forever engrained in his memory, too. 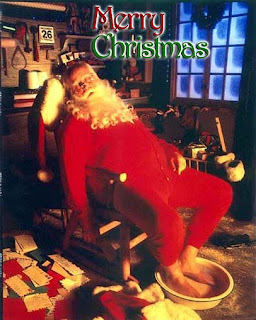 While you’re busy feeling like this image of Santa, just reflect on all the special memories made this year. That’s what I’ll be doing. Hope everyone had a great holiday. Would LOVE to hear your stories. “Mommy, is tomorrow Christmas Eve?” Kid #2 asked, batting her lashes over her big, brown eyes. “Huh?” She tilted her head to the side and scowled at Kid #1 like he was out of his mind. I laughed and made another cup of coffee. The countdown had begun, and I needed more caffeine if I planned to survive. Two days until Christmas and I have yet to buy groceries, vacuum, wrap, sign cards, or . . . gosh I’m sure there’s something else I’m forgetting. Oh well, it’ll come to me. So many times today while I pulled out my hair organized and prepared for the festivities, I paused and asked myself if I should just tell everyone I'm sick why we stress over something so simple, so wonderful, as getting ready for a family visit. Will they care if dust bunnies roll across the floor when they enter our home? Will they mind if there’s a fine layer of white dust covering all my furniture? They probably don’t mind, but I’m not going to give them the opportunity to notice any of those things. I’m such a clean freak. Tape! That's what I forgot. Tape. Well, I have to run out in the pouring rain now. Make sure you take time to relax during this crazy holiday season, and make sure you enjoy the time with your family. That's all that matters. Smiling and laughing with the people you love. Well if last week's countdown didn't freak you out, this one will. There are SEVEN days until Christmas. Eeep. I hope you've all completed your shopping by now. I haven't...despite my efforts. Sigh. I appreciate you stopping by and leaving comments...every Sunday is like Christmas with the Six Sunday visitors! ~He kneels until we’re eye level, holding me with his gaze. "Have you had waking dreams before?" "Y-yes. The first time was a couple days before we arrived here." To read other Six Sunday greatness, click here. For months I’d seen commercials exhibiting her beauty: cream colored skin with all the right make-up and a snow-white dress with fur wrapped hems and glittering undergarments. I had to have the Holiday Barbie, and in a bad way. Every Christmas list I wrote included her name. Every daydream involved stellar weddings between her and my most handsome Ken doll. I outfitted him with a tux well ahead of their meeting so when the special day came he’d be ready. My anticipation grew as the fateful day of her arrival drew near, sending my mind in whirling directions. What if Mom and Dad couldn’t afford Holiday Barbie? What if they didn’t think I deserved her? Did I tell them she’s all I wanted, all I cared about? Walking home from school, I gathered my coat in under my chin to block out the cold breeze. I ran the rest of the way home, pulling the key from under my shirt along the way. Being home alone for an hour or two before my parents arrived had advantages. I fumbled with the lock then dropped my book bag as soon as I stepped inside. “Where would they hide presents?” Looking around, I realized they wouldn’t be in the open. Closets . . . that’s where I hid everything. I rushed to the end of the hall and burst through the door into my parent’s room. Pushing their wooden chest toward the closet, I considered the trouble I’d get in if they found me, and ignored it. “Blankets. Pillows. Shoe boxes. 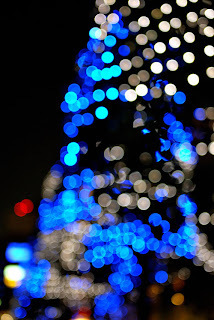 Nothing.” Disappointment rifled through me. Ready to give up, I stepped down from the make-shift ladder and accidentally brought one of the blankets down, too. 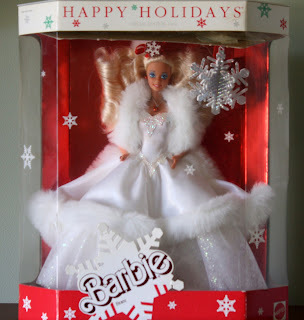 There, behind the remaining blankets and pillows, was Holiday Barbie. Her white box with pink writing, the metallic-red foil backdrop behind her brilliant-white dress, and her curly hair were like magic to my eyes. My parents remembered. They’d paid attention! Hands shaking, I resisted the urge to take her out of the box and replaced the blanket to its rightful spot. Once the room was back to normal and I was satisfied, I left to do my homework. But something else crept into my thoughts as I added and subtracted ridiculously small numbers: Guilt. How would I hide the fact I knew what they bought me? My reaction to unwrapping Holiday Barbie needed to be huge or else they’d be upset after all the nagging I did. How could I do that? Why did I do that? This feeling refused to leave me, refused to let me force it into the recess of my mind. Frustration and anxiety coursed through me all the way to Christmas morning, and when I opened the gift I wasn’t as excited as I should have been. I cried, then proceeded to tell them what I’d done. Mom and Dad didn’t take her away from me, and they didn’t yell or scream at me for hours. I’m pretty sure they knew the guilt and regret I felt was punishment enough. I swore never to go snooping again. How’s that title for alliteration? So I thought I’d try something a little different this week (and maybe in weeks to come). On Sundays I post six lines from my first novel (soon to be published, visit my site for more details), but I’m thinking maybe I can make Tuesdays a day to share from my current novel. Yes, they are from the same series, but I won’t post anything that spoils all the fun . . . just tidbits I feel confident and happy with . . . and the inspiration for that segment. Oh dear, I said inspiration. I once guest blogged with Derek Flynn about how Music is My Muse. When I’m writing deep, dark scenes—or light, fun ones—you can be sure I’m listening to music. There’s a horrific battle scene in Wilde’s Meadow that I am still tweaking, but am insanely happy with. The music I listened to (on repeat) while writing this is by Great Northern. The song is Numbers. Enjoy . . . and I hope you enjoy the tidbit. ~The creature [hound] lunges at Perth and lands just shy of taking a bite out of his ankle. Arland drives his sword into the beast, yanks out the bloody iron, then spins around on his heel and slices the head off a coscartha. The daemon’s dead, hollow eyes stare at me. Blood covers the sleeve of Brit’s left arm, but I can’t tell if it’s hers or another creature's. Flanna stands with her back to my sister, eyes flitting in all directions, breathing heavily, then releases an arrow into a tairb. The four of them are trapped in the center of thousands of daemons. Our allies are stuck on the outside, fighting desperately to get to my family. We need to use magic, and we need to use it fast. "Look at them, Katriona." Dughbal's hot breath burns my ear. "They will all die because of you." My mouth fills with the salty fluids always preceding throw up. I swallow, praying I don't lose control now. "No, if they die, they die because of you." He wraps his hands around my throat and squeezes, but not enough to strangle me, just enough to make me strain for air, to make me wish his hands would catch fire. "I could kill you now, but the boy’s soul yearns for your safety. He knows not of your betrayal...."
Now without further annoying commentary by me, I give you my six. To read more Six Sunday greatness, click here! Kid #3 faked me out Wednesday. She wailed and screamed and wouldn't walk. So I did what any good mother would do and ignored her rushed her to the hospital. It was POURING out. The roads were flooded and my ears were ringing from her high-pitched cries, but I pressed on. 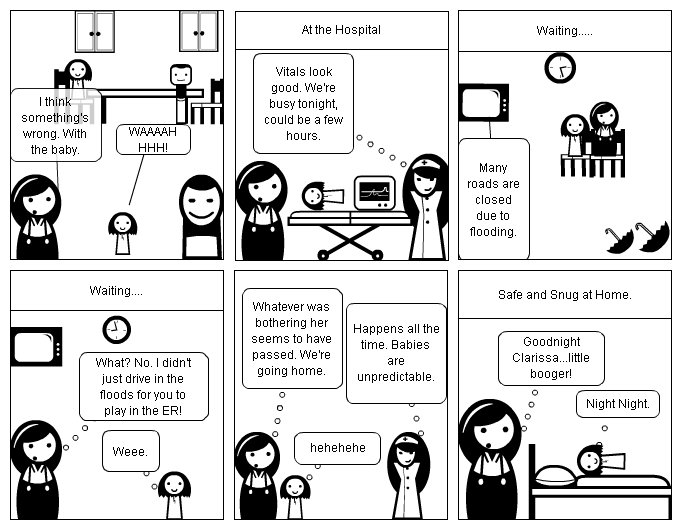 The triage nurse took all Kid #3's vital signs then said our wait could be a few hours. CRAP! But the baby was sick, so there I sat. After about an hour in the waiting room, her wails turned to laughter. She wanted to get up and run around. She sang her favorite song, Hello (if you've never heard it, I suggest checking it out...FUN), she squealed and smiled . . . and I thought "What the heck?!" So we signed her out and went home. She's been fine since. Hope everyone has a great weekend. In the evenings my husband and I watch a string of courtroom television. I’m not sure whether our enjoyment of the nightly trash is to make ourselves feel better or worse. Half of me can’t believe people like that exist. You know what I’m talking about, the kind of people who destroy others’ property and act like it’s no big deal, the kind that beats each other and fights over petty amounts of money. The cringe-worthy experience is good for the children too. We get to explain why one person is right or wrong and what not to do as a grown human being. Sometimes the topics go way over their heads, driving the kids to boredom and eventually to their toys. I don’t mind those times either. He nodded then went back to eating. “Eww! No!” Kid #1 piped in. She giggled and Kid #1 cringed. It’s funny how boys and girls view marriage differently. Kid #2’s question sidetracked the original intent of the conversation—thank God—and we finished our meals in peace. 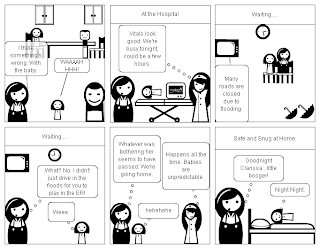 So does anyone else have any nightly rituals that spark funny conversations with your kids? I’d love to hear about them. Every week I find it's harder and harder to make a decision on what to share with you all. I hope you'll enjoy today's snippet. I feel it will "reveal" some fantasy aspects of my soon-to-be-published novel. “Where?” He must be joking. We haven’t even gone through the base and there’s nothing in front of us but trees and Darkness. “Nochtann,” Arland whispers, waving his hand in front of him. To read other awesome authors who participate in the Six, click here. Every week I review the search terms people used to land on my blog. Most of the time people use my name, or a post title, but this week there was a special search: Delete K R Y S T A L. Frankly I was appalled. Who would want to delete me? And what did I ever do to them? Geesh! A quick google of the exact same search terms revealed I was seventh in the list of delete K R Y S T A L's. I couldn't find anything standing out I thought this person was searching for. So should I be upset? Was someone looking for a way to off me? Did I infuriate a blog reader? I guess I'll never know, but it will go down in history as the strangest blog hit ever. When I See You . . . When I see you, my car is warm, comfortable, full of music and life. When I see you, I’m waiting at the last red light before arriving at work. When I see you stand on the corner of 2nd and E, arms wrapped around your frail frame, I imagine how cold or hot you must be. When I see you, some days your clothes are tattered and ill fitting and others you appear to have been first in line at Goodwill hand outs. When I see you, I tell myself to be a better person, to bring you lunch, to have a conversation with you . . . to help. Then the light turns green, and I forget. When I see you again, my eyes fill with tears, my heart squeezes in my chest. I forgot about you yesterday, forgot to bring you a sandwich, forgot to offer you a short story . . . forgot to be a good person. When I see you, I imagine the life you must have lived, how you came to stake claim on this small corner right outside the shelter in Washington, D.C. When I see you, I wonder if you have family, friends, or anything to “return” to. I saw you this morning, you were smiling, hugging two women, talking. I cried. I forgot about you again. Someone else was the good person I should have been, someone else asked you about your life, someone else worried about your well being while I only worried about getting to work on time. When I see you, I’m going to give you this letter. When I see you, I hope God blesses you and provides you comfort. When I see you, I hope to be witness to your smile. It’s beautiful . . . just like you.